The kestrel is the smallest of the American falcons, ten or eleven inches long. Upper parts chestnut red; wings and lower part of back barred. Top of head head slate blue, black patches beneath the eyes and behind the ears. Brown barred white-tipped tail, under parts buff white with black spots on the sides. Abundant and widespread. 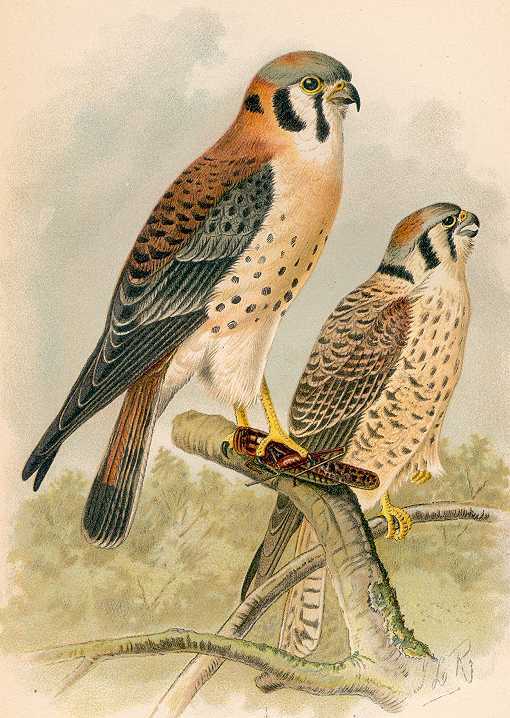 American kestrels range throughout North America and northern South America in forests, open prairies, farms, towns and cities. More than a dozen subspecies complete a world wide range. Eats mostly mice and insects such as grasshoppers and spiders. Also eats snakes, lizards, small birds and rodents, however, they take few birds when insects and mice are abundant. It does not soar high like its hawk cousins. With its incredibly keen eyesight it scans a broad landscape from a high perch. From there it can spot game from further away than seems possible. It also flies swiftly and gracefully near the ground. When it spots something it hovers motionless in mid air waiting for the right opportunity. Then suddenly it swoops down to the ground and arises with its prey in its talons. It builds no nest. It deposits its eggs in the natural or abandoned cavities of high trees and deserted magpie nests. Or in rock crevices and stone quarries and in holes high in river banks. Near people in nooks in buildings on farms and often in cities in places like church steeples. Females lay about four or five speckled eggs of varying colors. Eggs hatch after about four weeks of incubation and young leave the nest after about another four weeks. The Kestrel Nest Box is the same as for Barrow’s Goldeneye and Screech Owls. It has an 8″ by 8″ floor and a 15″ inside floor to ceiling height. A 3″ diameter entrance hole is located 12″ above the floor. Ventilation openings are in the floor and under the roof. A hinged roof can be secured in closed position with shutter hooks. Or a fixed roof and Side Opening Doors may be more convenient and safer when monitoring at heights. Attach this nest box to a high tree at the edge of a forest area. Or on a post in an open area in a rural or city yard. It should be mounted between twelve and twenty feet high. Also place a bed of wood chips, not sawdust, on the floor. Screech owls and Squirrels also may use this box. Abundant and widespread. 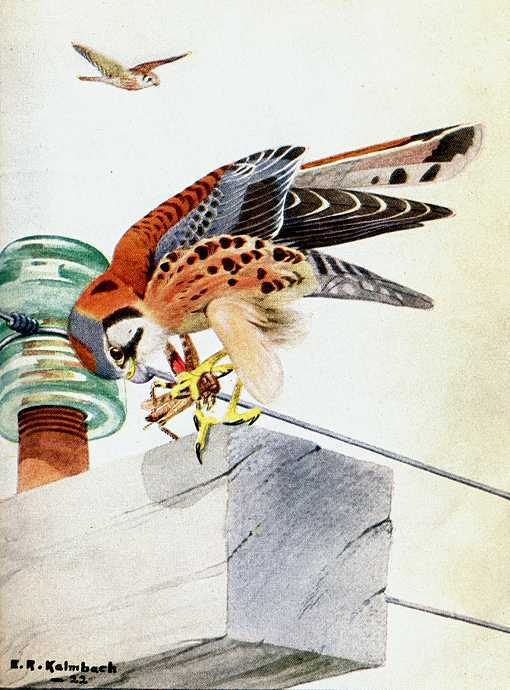 American kestrels range throughout North America and northern South America in forests, open prairies, farms, towns and cities. More than a dozen subspecies complete a world wide range. Place a bed of wood chips, not sawdust, on the floor. Only experienced trades workers should mount this nest box high at the edge of a forest area or on a post in an open area in a rural or city yard between twelve and twenty feet high.